What are the capacity factors of America’s wind farms? In energy it is important know what to count. Consider this simple question. Which country is number one in terms of wind energy? In terms of total installed wind capacity it is China. At the end of last year it had 114 GW of installed capacity, in contrast to 66.2 GW in the United States (BP, 2015). China is number one, then, by a long way. Not so fast. Last year America’s wind farms produced a total of 183.6 TWh of electricity, whereas China’s produced 158.4 TWh (BP, 2015). So in terms of electricity generated by wind farms America is number one. There are multiple reasons for China’s wind turbines producing less electricity than America’s. China has a dreadful record when it comes to connecting wind farms to the electricity grid. Much of their capacity simply is not connected to the grid. Using BNEF figures for grid-connected capacity, it appears that almost 20 GW is not connected to the grid. Furthermore, China appears to curtail approximately 20% of the electricity generated by its wind farms (Reuters). In fact, curtailment doubled in the first three months of this year. If, like me, you are skeptical about China’s “war on pollution” you might draw an obvious conclusion. If China is serious about air pollution why is it drastically limiting the output of its wind farms? The other, and equally important reason, is capacity factor. China’s wind farms have mean capacity factors of around 23% (Stanford, 2010). However, America’s are much higher. In 2013 and 2014 the annual mean capacity factor of America’s wind farms was 32.3 and 33.9% respectively (EIA). This is much higher than other countries. Britain has the highest mean capacity factor for onshore wind in Europe (Boccard, 2009). Official statistics show that mean capacity factor of Britain’s wind turbines was 27.8% over the last 5 years (DECC). Annual averages can of course mask variations throughout the year. A well located solar panel can have a capacity factor of over 20%. However, no matter how well located it will always produce no electricity at midnight. The same goes for wind farms. Aggregated at the level of a country – or the level of individual states in America’s case – wind farms are expected to regularly produce close to zero power. However, seasonal variation is of interest because we prefer seasonal wind farm output to be highest wind electricity demand is highest. Here I will consider monthly variations in load factor. 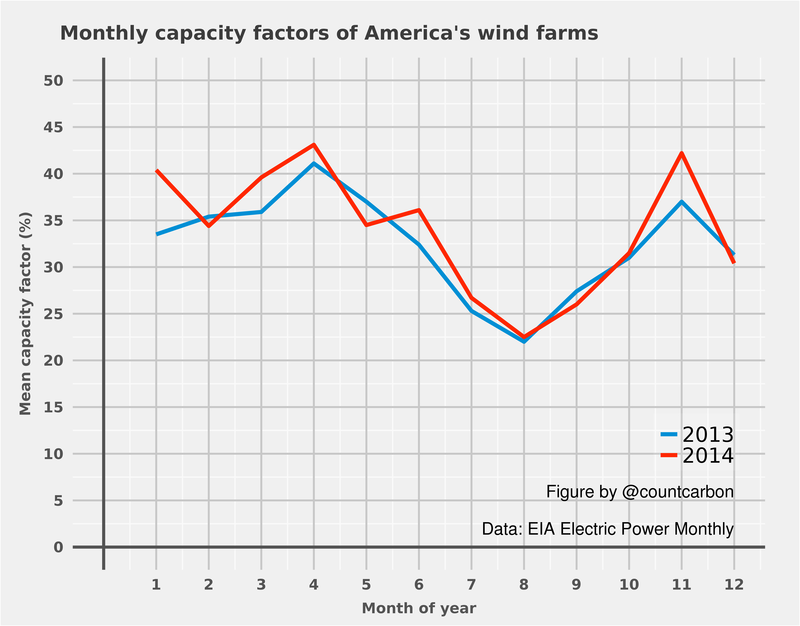 The U.S. Energy Information Administration (EIA) now produces monthly estimates of mean capacity factors of America’s wind farms (EIA). The figure below shows monthly capacity factors in 2013 and 2014. Monthly variations are clearly significant. In both years, capacity factor peaks in April, with the lowest point in August. In both years the best month has a mean capacity factor of almost twice that of the worst month. This seasonal variation is problematic. In a world intelligently designed, nature’s rhythms would accord with humanity’s desires. Wind farms would produce electricity exactly when we need it. Fortunately, the world is not intelligently designed. Wind farms do not produce electricity exactly when we need it most. American electricity demand peaks in July and August, whereas minimum demand is in April (EIA Electric Power Monthly). In other words, America’s wind farms are at their least productive when electricity demand is at its highest, and vice versa. This of course masks some key regional differences. California’s wind farms, for example, are most productive in summer; a reversal of the large-scale pattern in America. However, the general problem holds. An America which gets a significant proportion of its electricity needs form wind farms will likely have to curtail large amounts of generation in spring. Do they check facts and logic at The Conversation?